This bulldog is obviously a little under the weather, but he clearly is being well taken care of. 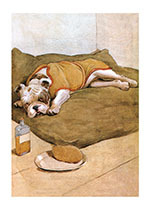 This bulldog is obviously a little under the weather, but he clearly is being well taken care of. Will he be good about taking that medicine? From My Dog by Maurice Maeterlinck, illustrated by Aldin in 1902.